Directions: The best way to get to the actual site is by car, although theoretically if you are adventurous you could bike or hike from the nearest train station several miles away. For Westerners, first fly to Narita (Tokyo), then rent a car and drive to the listed coordinates. Unless you are incredibly proficient at reading Japanese, and willing to get lost, you will need a GPS to find this place. 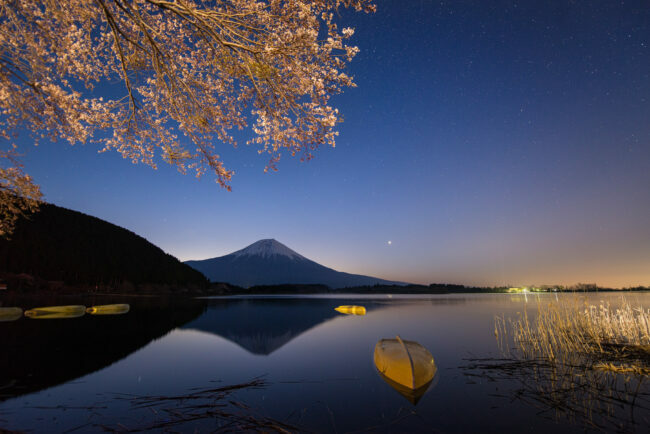 It will take 1-2 hours to get to Tokyo proper, and then another 3 hours or so to get to the lake from there, so you'll probably want to get some lodging in the nearby town of Kawaguchi, which is also a pretty good spot for taking pictures. There's lots of very nice rest stops along the road too. 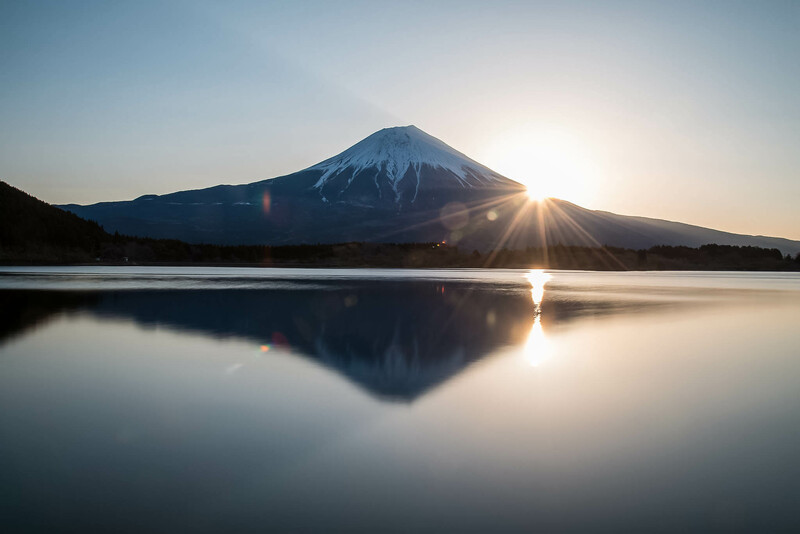 This is the premiere location for taking pictures of Mount Fuji at sunrise. It also has by far the best reflection, i.e. most likely to have smooth water. There is a nice path on the shoreline and a little campground with vending machines and restrooms at the main parking lot. You will be facing east, and dependent on the time of year the sun will rise behind the mountain, giving the “diamond Fuji” view for a brief few days every year. You will want to bring a tripod, an ultra wide lens, and a normal-range zoom. I got a lot of nice shots with the 10 stop ND as well. Expect to see a lot of very serious photographers around, with some very expensive gear on display, many with rolling carts full of stuff. Late winter/early spring are the best times as they offer the clearest air and least chance of haze/fog/overcast. But the weather is often uncooperative and the forecasts are often wrong so there’s a very real chance you’ll get skunked at least once. Fall is also a nice time. 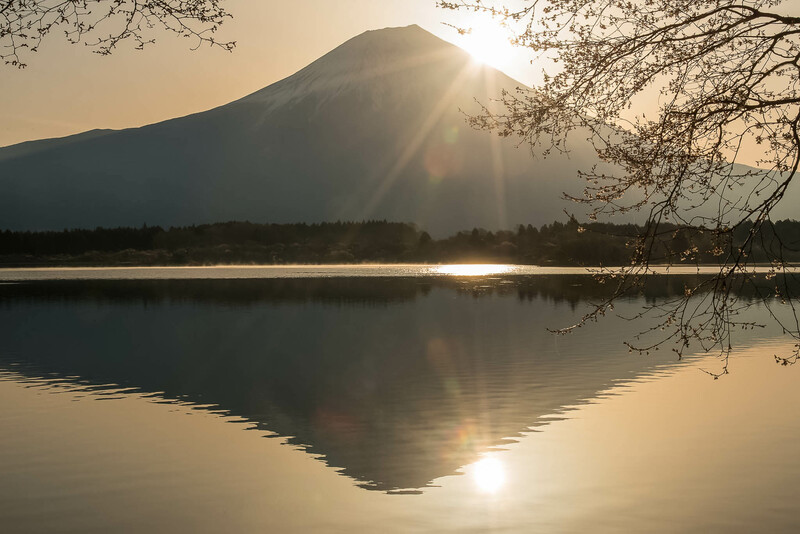 Japan is in the wrong time zone, meaning the sun rises absurdly early. As such, you’ll need to be in position as early as 4am dependent on the season. Because of this, you may just choose to arrive during the night for star pictures. It’s rare to find a nice night for stars, but it does exist, although there is always a lot of light pollution from Tokyo. For bird watchers, there’s frequently interesting waterfowl on the lake, and the surrounding hills have some prized species such as Narcissus Flycatchers. There’s a lot of other great photo spots nearby but I’ll discuss them separately.